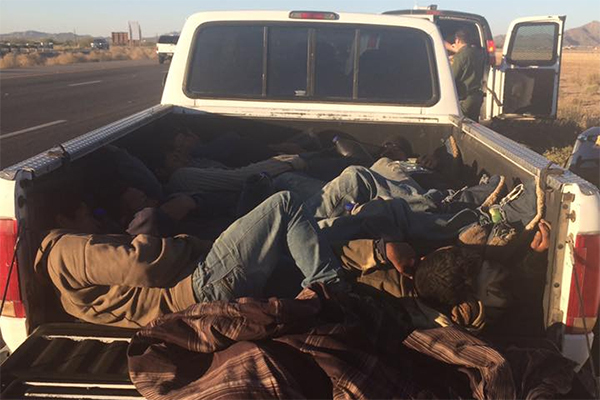 According to the Pinal County Sheriff’s Office, 14 people who entered the United States illegally from Mexico were arrested Thursday afternoon on Interstate 10. Most were found in the bed of a pickup truck. A deputy with the PCSO K9 unit stopped the 1994 Ford pickup after allegedly observing several traffic violations near mile mark 194 on I-10. After placing the driver in custody, the deputy pulled back the blanket and found several people lying in the truck bed. Babeu said they were wearing a “carpet shoes” to conceal tracks and had several gallon bottles of water. A total of 14 people were in the vehicle. Babeu said all had entered the country illegally. The driver was cited for traffic violations and turned over to U.S. Border Patrol, who also took custody of the others and the pickup.